dawn arises, a moving wind of light casalgrande padana, reggio emilia, october second twothounsandten inauguration of architect kengo kuma’s landscape artwork with light by mario nanni the entrance of a company becomes a stage design thanks to the landscape artwork by architect kengo kuma and light designed by mario nanni. an urban sculpture, a cloud of ceramic slabs of stoneware, that grows from the ground connoting an architecture in the horizon: a manufactured wall as a natural element amongst authentic natural elements, man’s work of art in the environment that hosts it. 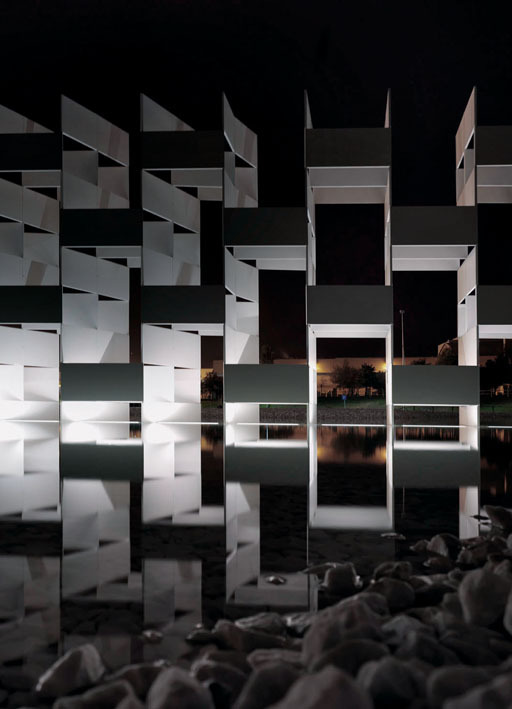 a landmark: a 6 meter high wall, 45 meters long, in the middle of a 60m diameter roundabout, that contains an 800m2 lake and 2000m2 of carrara’s marble. 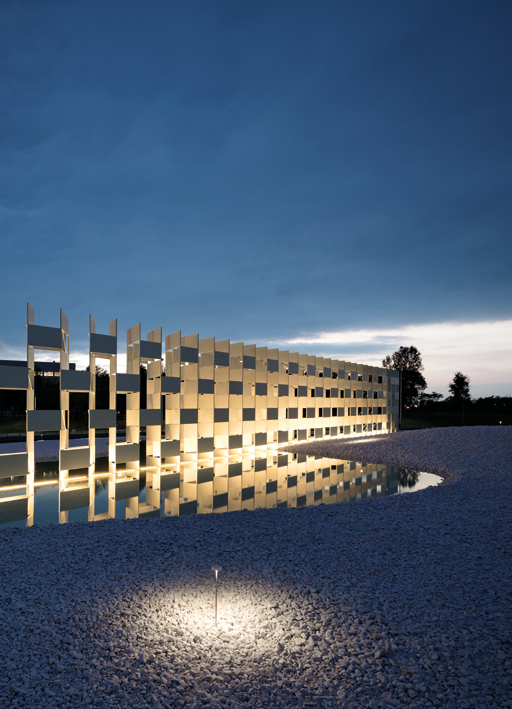 a matter yet rarefied architectural work, standing in front of casalgrande padana’s plant. 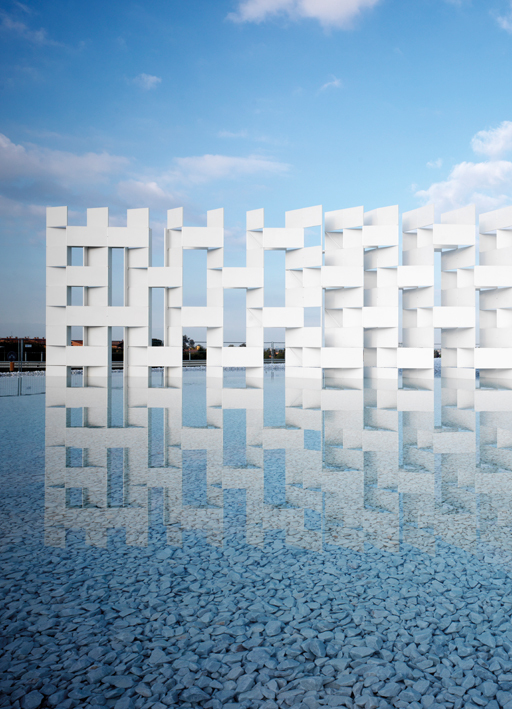 assembling 1052 pure white ceramic slabs, in nine different typologies and dimensions closely cooperating with the steel skeleton, the japanese architect wanted to revisit the conventional idea of ceramic as mere finishing, granting it new structural and figurative potentialities in 3d space. from plain coating to structure, sheets of ceramic turned into a wall: not a partition mark, not a limit, but a glimmer, a better vision cone, a sequence of frames. significance has been given to the landscape that hosts us, letting it involve us in the scenes that give life to it: this artwork is a vista towards the surroundings, a viewfinder, an instrument for watching the season pass, with the rotation of colours, lights and atmospheres. natural light appears to be a real project element in this first work in italy by architect kuma; for this reason he also decided to give importance to night light, that is therefore thought, designed, felt as an element essential for the final result. kengo kuma draws the project, mario nanni translates the light concept. a light of wind comes up: a significant combination of ripple movements, white shades that brush the work’s volume like a tide on the water’s edge, like wind on foliage. natural element and man’s talent carry on in symbiosis for this work. the wall gains strength and shape. it becomes a structure, a monolith: strong and solid, delicate and rarefied at the same time, dreamlike and symbolic, full of significance. a cloud. the light show is actually inspired by clouds moved by wind, clouds that allow sunrays to pass through them with a variety of white tones: from yellow to light blue, reaching pure white at noon. placed along the perspective fugue of the highway trail that takes to casalgrande padana, the work appears to the spectator progressively, creating a changeable scenery while reaching it: from a side view it appears to be a very thin and sharp line, passing to its front view it becomes a surface 45 meters long: a scene permeable to light in perfect interaction with the water and marble surroundings. 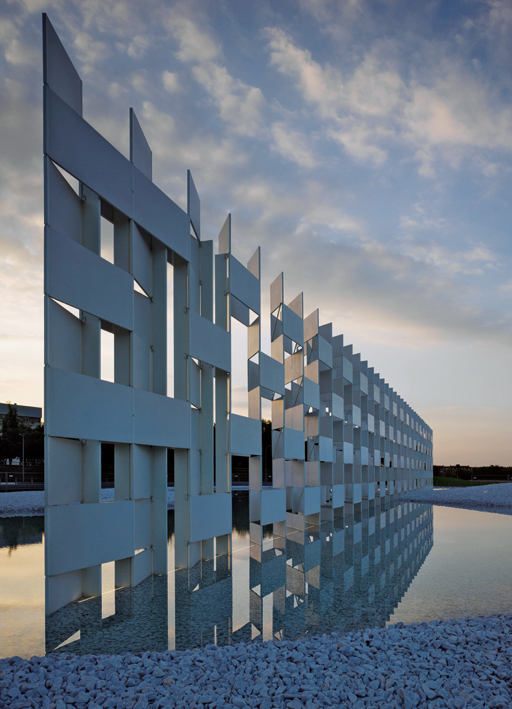 created to celebrate the fiftieth anniversary of casalgrande padana and its strong relationship with the territory, kengo kuma’s work becomes itself part of the history of the firm. cccloud is an evanescent vision that comes into sight with the brilliant white of the tiles and the pureness of marble. 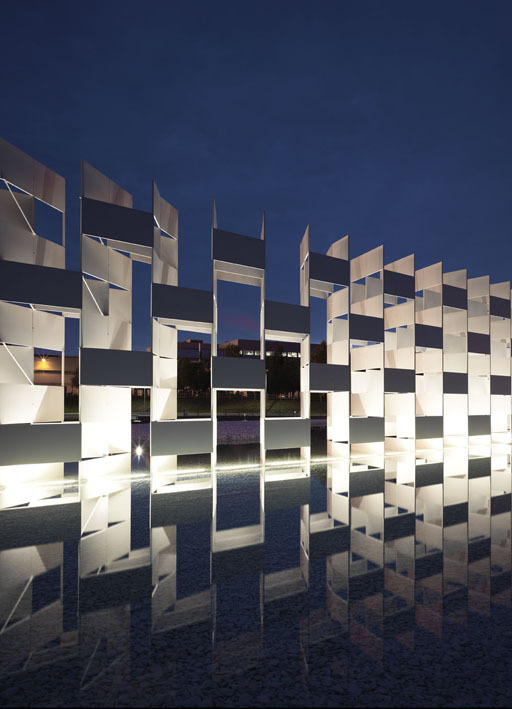 during sunset, the light show begins from the middle of the wall expanding its rays like glares of a rising sun, a magic that comes to shape, a continuing moving tale that narrates to the viewer the play of light, the geometrical charm of the ceramic tiles that become white sheets, papers ready to capture artificial light. two light fitting have been designed and engineered appositely by Viabizzuno according to the indications and the needs of the japanese maestro, who decided to called them unaghi and tsukimiso; two names highly evocative that mean eel and night flower. unaghi is in fact an eel of light: a luminaire studied to be installed also under water, a line of light in pyrex, cabled with different white temperature led. 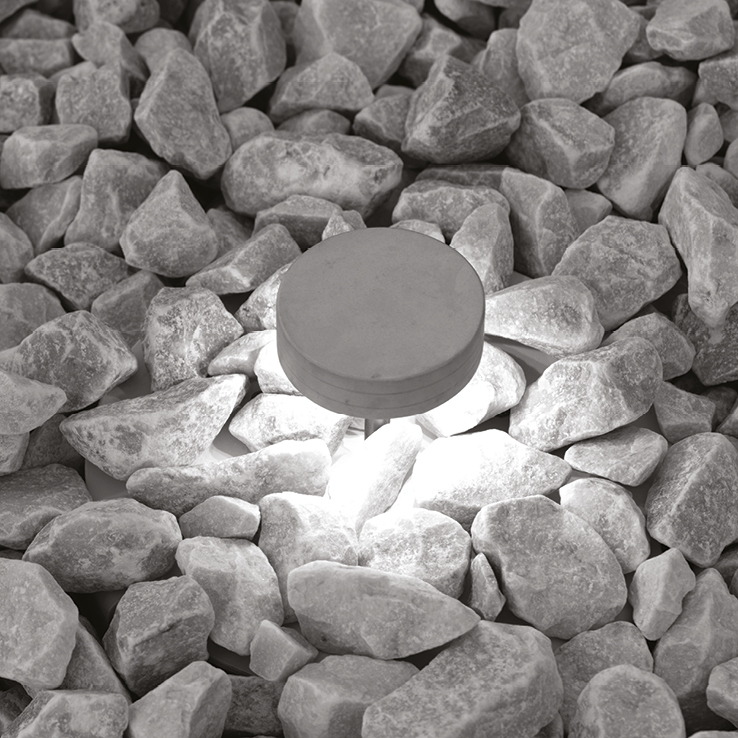 the unaghis placed at the foot of the wall become its base of light, disappearing in the water glares and during the day almost impossible to be glimpsed among the marble pebbles, yet at night, switched on, they create emotion-full light sets. managed by a remote system that foresees several configurations, the unaghis enlighten the wall with white lights that go from the cold 5000K tones to the warmer 3000K, passing through the medium 4000K. artificial light is modulated and declined just like natural light does, it brushes the matter surface of the wall like wind, the colour temperature of the light source becomes narrative instrument, the story of the hours that pass on architecture and on everybody’s life. during the day, the tsukimiso sleep hidden and camouflaged amongst the precious gravel of carrara’s marble, night flowers that slowly spring out after dusk, emerging with grace, bringing along a shine, more and more open and wide, rising gradually from the ground. 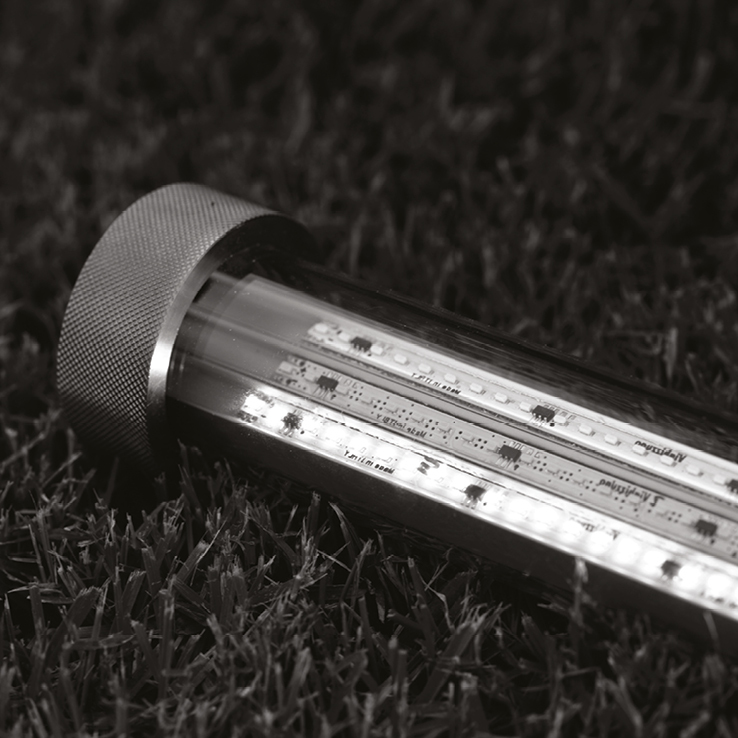 an entirely rollaway luminaire, only the head emerges slightly, to mark its presence. throughout advanced pistons the tsukimisos raise their stem from the ground reaching 60 cm, they bloom in the darkness, their light opens out soft and delicate, bringing the view towards the wall work. it’s the contrast between the matter and un-matter of light. light design chases the intrinsic symbolic value of white, linked to the idea of pureness, exemplified by the neatness of ceramics. this project has combined an innovative process of interaction amongst business production, project culture, research and university training. thanks to the landmark designed by kengo kumo and light design by mario nanni the entrance of a company is transformed into an instrument for watching the season passing, their changing of colours, light and atmosphere. a wind of light.